It is a splendid coincidence that 2014 has seen two major movies about great British scientists, first Alan Turing (The Imitation Game) and now Stephen Hawking in The Theory of Everything. When, as a young doctoral student, Stephen Hawking was first diagnosed with motor neurone disease he was given two years to live. Now aged 72, he continues to work on the very thing that he himself has cheated: time. 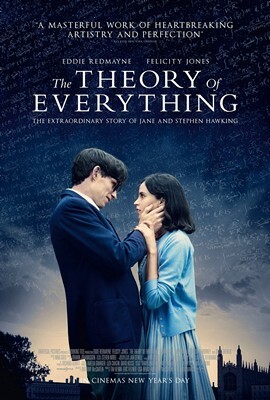 The Theory of Everything is based on the memoir of Hawking’s first wife, Jane, titled “Travelling to Infinity: My Life with Stephen Hawking”. It tells the intertwined stories of Stephen’s intellectual indomitability in the face of a debilitating, incurable illness, and his life with Jane until their eventual separation in the mid-90s. Despite the reputation of Hawking’s bestselling “A Brief History of Time” as a book that many have bought but fewer read, The Theory of Everything doesn’t burden the audience with scientific detail. In fact, I envisage that from this point on physics teachers across the land will use a potato and a pea to explain the tension between gravitational forces and quantum forces. It is Stephen and Jane’s romance that is to the fore through much of the film. With his large glasses permanently perched halfway down his nose and hair swept across his eyes, the young Stephen appears superficially to be the epitome of the nerdy scientist. Yet his personality is a curious mix of bashfulness and confidence, laced with humour. He and Jane, who studies medieval Iberian poetry, are clearly attracted upon first meeting, despite their first conversation revealing that he is an atheist and she a Christian. At the Cambridge May Ball, when asked about the poetry of the 1920s Jane teases Stephen with Yeats’s lines: “Seek then / No learning / from Starry Men / Who follow with Optic Glass / The Whirling Ways of Stars that Pass”. “Ouch!” says Stephen. He in turn, asked about the science of the 1920s, talks romantically about space and time in relationship terms: “People always thought they were too dissimilar, couldn’t possibly work out. But then along comes Einstein, the ultimate matchmaker, and decided that space and time not only had a future, but had been married all along”. Standing beneath a starry sky, Jane quotes the bible (“In the beginning was the heaven and the earth…”), which leads Stephen to take her hand and ask her to dance, a significant moment because he earlier said that he never dances. Stephen’s illness manifests itself even before he has been awarded his PhD, but despite the prognosis of imminent death he continues to work. Jane determines that they must fight the disease, even though she has been warned that the only outcome can be defeat. She and Stephen get married, have children, and she does all she can to support Stephen. Over the years, however, the strain begins to tell. At Stephen’s suggestion Jane joins a local choir, only to find herself attracted to the widowed choirmaster. Later, Stephen finds himself attracted to Elaine, a nurse who has been brought in to assist with his caring. Following the publication of “A Brief History of Time” Stephen tells Jane that Elaine will be accompanying him to a meeting in America, at which point it becomes clear that their marriage is at an end. Anthony McCarten’s sparkling script is full of wit, which adds depth and variety to a tale that might otherwise have been a standard one about triumph over adversity. Those of us who have recently seen the re-release of 2001: A Space Odyssey cannot fail to have been thrilled and amused by the first words that Stephen speaks with the aid of his voice synthesiser: “Daisy, daisy, give me your answer do…”. Although there is not a natural dramatic end point for the story, McCarten contrives a device to wrap things up that is moving and satisfying. Eddie Redmayne gives a remarkable performance as Stephen Hawking, whose increasingly severe symptoms are displayed, with attendant frustration, in accurate detail and without exaggeration. Nonetheless, even when Stephen has become entirely immobile Redmayne is able to convey his mischievous wit with just a look. Surely Redmayne will be shortlisted for the upcoming Oscars. Alongside Redmayne, plaudits are also due to Felicity Jones for her portrayal of Jane, who is absolutely convincing as the woman whose love and devotion eventually gives way to exhaustion and resentment, but ultimately mutual acceptance. Benoit Delhomme’s cinematography must also be mentioned. Almost every scene, both interior and exterior is bathed in glowing – often golden – light. Cambridge has surely never appeared so beautiful. This lighting not only suits the theme of romance, but also serves as a reminder of Jane’s religious belief and Stephen’s interest in the stars. The Theory of Everything is a wonderful film that will have audiences laughing even as they choke back the tears. The Theory of Everything was previewed at the British Film Institute on 8th December 2014.